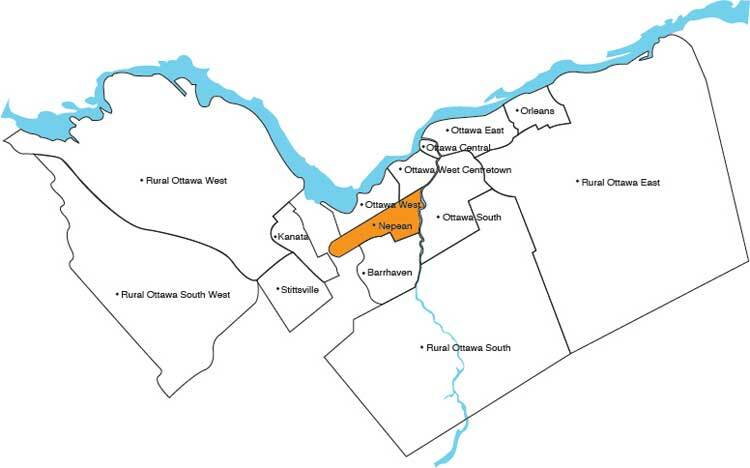 The community of Hog's Back-Prince of Wales is bounded by Heron Road, Fischer Avenue, and the Rideau River. The community is mainly English speaking but almost a quarter of the population speaks another non-official language. Hog's Back Falls and several locks on the Rideau Canal system are part of the community and give residents great opportunities for enjoying nature with a large biking and walking path system that runs along both places and continues into other communities in the city. Average house age: Most houses were built between 1965 and 1985. Detached homes: 75% of homes are detached. 25% are semi-detached and row houses. House prices - detached homes*: Recent sales vary from $300,000 to $2,200,000 with 30% under $400,000. House prices - semi-detached homes and row houses*: Recent sales vary from $275,000 to $500,000 with 67% under $300,000. Have us help you find a home in this area. There are many recreational opportunities available for the residents of Hog's Back-Prince of Wales. There are baseball diamonds, basketball courts, play structures, two outdoor wading pools, a sports field, a volleyball court, a tennis court, and three outdoor rinks. The community is also home to a community garden for the residents to enjoy. There is also a Community BBQ, a Christmas Craft Sale, and Greekfest that happen annually. Finally, the Rideau Canoe Club is near to the community and is very popular with all ages who are interested in competitive boating activities. Where is Hog's Back-Prince of Wales? Hog's Back-Prince of Wales is in Nepean. Regular updates on what to do in Ottawa, real estate statistics and more.